This twenty-fourth article, which is part of the series on Linux device drivers, gets the complete real SIMULA file system module in action, with a real hardware partition on your pen drive. With all these and earlier details, Shweta completed their project documentation. And so finally, Shweta & Pugs were all set for their final semester project demo, presentation and viva. write_inode (under struct super_operations) – sfs_write_inode() basically gets a pointer to an inode in the VFS’ inode cache, and is expected to sync that with the inode in physical hardware space file system. That is achieved by calling the appropriately modified sfs_update() (defined in real_sfs_ops.c) (adapted from the earlier browse_real_sfs application). The key parameter changes being passing the inode number instead of the filename and the actual timestamp instead of the flag for its update status. And accordingly, the call to filename based sfs_lookup() is being replaced by inode number based sfs_get_file_entry() (defined in real_sfs_ops.c), and additionally now the data blocks are also being freed (using sfs_put_data_block() (defined in real_sfs_ops.c)), if the file size has reduced. Note that sfs_put_data_block() (defined in real_sfs_ops.c) is a transformation of the put_data_block() from the browse_real_sfs application. Also, note the interesting mapping to / from the VFS inode number from / to our zero-based file entry indices, using the macros S2V_INODE_NUM() / V2S_INODE_NUM() in real_sfs_ops.h. timestamp = inode->i_mtime.tv_sec > inode->i_ctime.tv_sec ? create, unlink, lookup (under struct inode_operations) – All the 3 functions sfs_inode_create(), sfs_inode_unlink(), sfs_inode_lookup() have the 2 common parameters (the parent’s inode pointer and the pointer to the directory entry for the file in consideration), and these respectively create, delete, and lookup an inode corresponding to their directory entry pointed by their parameter, say dentry. Real SFS maintains only one timestamp and that is mapped to all 3 of created, modified, accessed times of the VFS inode. sfs_inode_create() and sfs_inode_unlink() correspondingly invokes the transformed sfs_create() and sfs_remove() (defined in real_sfs_ops.c) (adapted from the earlier browse_real_sfs application), for respectively creating and clearing the inode entries at the underlying hardware space file system, apart from the usual inode cache operations, using new_inode()+insert_inode_locked(), d_instantiate() & inode_dec_link_count(), instead of the earlier learnt iget_locked(), d_add(). Apart from the permissions and file entry parameters, and replacing lseek()+read() combo by read_entry_from_real_sfs(), sfs_create() has an interesting transformation from user space to kernel space: time(NULL) to get_seconds(). And in both of sfs_create() and sfs_remove() the user space lseek()+write() combo has been replaced by the obvious write_entry_to_real_sfs(). Check out all the above mentioned code pieces in the files real_sfs.c and real_sfs_ops.c, as mentioned. readpage, write_begin, writepage, write_end (under struct address_space_operations) – All these address space operations are basically to read and write blocks on the underlying filesystem, and are achieved using the respective generic kernel functions mpage_readpage(), block_write_begin(), block_write_full_page(), generic_write_end(). First one is prototyped in <linux/mpage.h> and remaining 3 in <linux/buffer_head.h>. Now, though these functions are generic enough, a little thought would show that the first three of these would ultimately have to do a real SFS specific transaction with the underlying block device (the hardware partition), using the corresponding block layer APIs. And that exactly is achieved by the real SFS specific function sfs_get_block(), which is being passed into and used by the first three functions, mentioned above. sfs_get_block() (defined in real_sfs.c) is invoked to read a particular block number (iblock) of a file (denoted by an inode), into a buffer head (bh_result), optionally fetching (allocating) a new block. So for that, the block array of corresponding real SFS inode is looked up into and then the corresponding block of the physical partition is fetched using the kernel API map_bh(). Again note that to fetch a new block, we invoke the sfs_get_data_block() (defined in real_sfs_ops.c), which is again a transformation of the get_data_block() from the browse_real_sfs application. Also, in case of a new block allocation, the real SFS inode is also updated underneath, using sfs_update_file_entry() – a one liner implementation in real_sfs_ops.c. Code snippet below shows the sfs_get_block() implementation. open, release, read, write, aio_read/read_iter (since kernel v3.16), aio_write/write_iter (since kernel v3.16), fsync (under a regular file’s struct file_operations) – All these operations should basically go through the buffer cache, i.e. should be implemented using the address space operations. And this being a common requirement, the kernel provides a generic set of kernel APIs, namely generic_file_open(), do_sync_read()/new_sync_read() (since kernel v3.16), do_sync_write()/new_sync_write() (since kernel v3.16), generic_file_aio_read()/generic_file_read_iter() (since kernel v3.16), generic_file_aio_write()/generic_file_write_iter() (since kernel v3.16), simple_sync_file()/noop_fsync() (since kernel v2.6.35). Moreover, the address space operations read & write are no longer required to be given since kernel v4.1. Note that there is no API for release, as it is a ‘return 0‘ API. Check out the real_sfs.c file for the exact definition of struct file_operations sfs_fops. readdir/iterate (since kernel v3.11) (under a directory’s struct file_operations) – sfs_readdir()/sfs_iterate() primarily reads the directory entries of an underlying directory (denoted by file), and fills it up into the VFS directory entry cache (pointed by dirent parameter) using the parameter function filldir, or into the directory context (pointed by ctx parameter) (since kernel v3.11). As real SFS has only one directory, the top one, this function basically fills up the directory entry cache with directory entries for all the files in the underlying file system, using the transformed sfs_list() (defined in real_sfs_ops.c), adapted from the browse_real_sfs application. 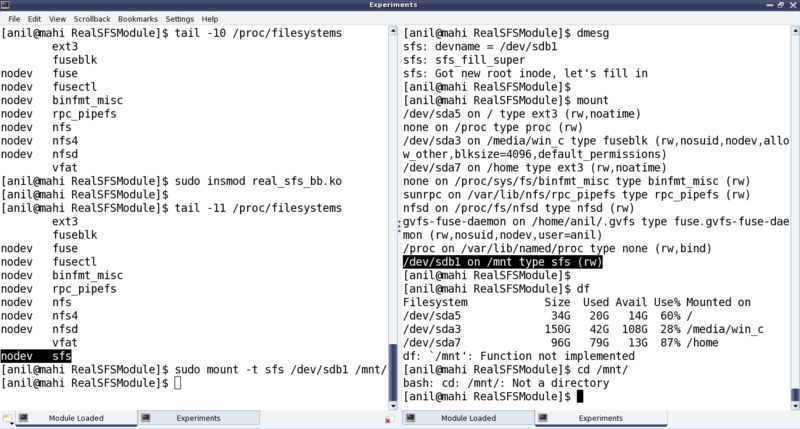 Check out the real_sfs.c file for the complete sfs_readdir()/sfs_iterate() implementation, which starts with filling directory entries for ‘.‘ (current directory) and ‘..‘ (parent directory) using parameter function filldir(), or generic kernel function dir_emit_dots() (since kernel v3.11), and then for all the files of the real SFS, using sfs_list(). put_super (under struct super_operations) – The previous custom implementation sfs_kill_sb() (pointed by kill_sb) has been enhanced by separating it into the custom part being put into sfs_put_super() (and now pointed by put_super), and the standard kill_block_super() being directly pointed by kill_sb. Check out the file real_sfs.c for all these changes. With all these in place, one could see the amazing demo by Pugs in action, as shown in Figure 40. And don’t forget watching the live log in /var/log/messages using a ‘tail -f /var/log/messages‘, matching it with every command you issue on the mounted real SFS file system. This would give you the best insight into when does which system call gets called. Or, in other words which application invokes which system call from the file system front. For tracing all the system calls invoked by an application/command, use strace with the command, e.g. type ‘strace ls‘ instead of just ‘ls‘. This entry was posted in Linux Device Drivers and tagged aio_read, aio_write, create, Device Drivers, File System Drivers, File System in Action, File System Modules, File Systems, Final Semester Project, fsync, iterate, kill_sb, LFY, Linux, lookup, map_bh(), open, OSFY, put_super, read, readdir, readpage, read_iter, Real SFS, Real Simula File System, release, SFS, Simula File System, struct address_space_operations, struct file_operations, struct inode_operations, struct super_operations, unlink, VFS, write, writepage, write_begin, write_end, write_inode, write_iter on January 1, 2015 by Anil Kumar Pugalia. This twenty-fourth article of the mathematical journey through open source, demonstrates the concepts of graph theory for playing with graphs using the graphs package of Maxima. In our previous article, we familiarized ourselves with the notion of simple graphs, and how graphs package of Maxima allows us to create and visualize them. Assuming that knowledge, in this article, we are going to play with graphs and their properties, using the functionalities provided by Maxima’s graphs package. Graph on 4 vertices with 2 edges. Graph on 4 vertices with 3 edges. Graph on 3 vertices with 1 edges. Graph on 4 vertices with 1 edges. Digraph on 4 vertices with 3 arcs. Graph on 8 vertices with 6 edges. graph_order(<g>), vertices(<g>) returns the number of vertices and the list of vertices, respectively, in the graph <g>. graph_size(<g>), edges(<g>) returns the number of edges and the list of edges, respectively, in the graph <g>. is_isomorphic(<g1>, <g2>) – returns true if graphs <g1> and <g2> have the same number of vertices and are connected in the same way, false otherwise. And, isomorphism(<g1>, <g2>) returns an isomorphism (that is a one-to-one onto mapping) between the graphs <g1> and <g2>, if it exists. Lot of properties of graphs are to do with vertex and edge neighbourhoods, also referred as adjacencies. For example, a graph itself could be represented by an adjacency list or matrix, which specifies the vertices adjacent to the various vertices in the graph. adjacency_matrix(<g>) returns the adjacency matrix of the graph <g>. Number of edges incident on a vertex is called the valency or degree of the vertex, and could be obtained using vertex_degree(<v>, <g>). degree_sequence(<g>) returns the list of degrees of all the vertices of the graph <g>. In case of a directed graph, the degrees could be segregated as in-degree and out-degree, as per the edges incident into and out of the vertex, respectively. vertex_in_degree(<v>, <dg>) and vertex_out_degree(<v>, <dg>) respectively return the in-degree and out-degree for the vertex <v> of the directed graph <dg>. neighbors(<v>, <g>), in_neighbors(<v>, <dg>), out_neighbors(<v>, <dg>) respectively return the list of adjacent vertices, adjacent in-vertices, adjacent out-vertices of the vertex <v> in the corresponding graphs. average_degree(<g>) computes the average of degrees of all the vertices of the graph <g>. max_degree(<g>) finds the maximal degree of vertices of the graph <g>, and returns one such vertex alongwith. min_degree(<g>) finds the minimal degree of vertices of the graph <g>, and returns one such vertex alongwith. A graph is ultimately about connections, and hence lots of graph properties are centred around connectivity. 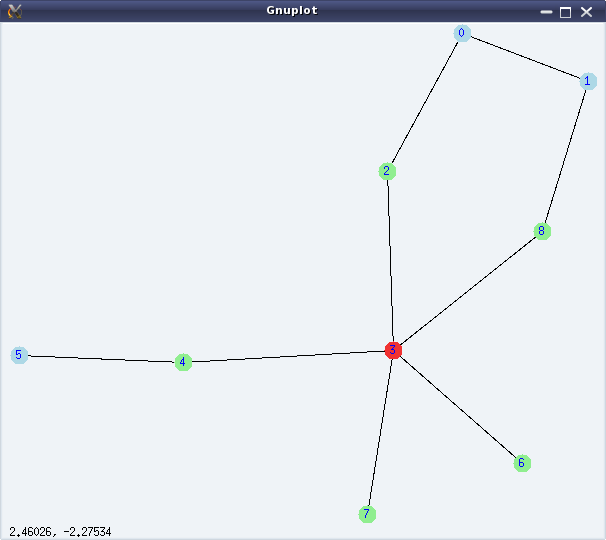 vertex_connectivity(<g>) returns the minimum number of vertices that need to be removed from the graph <g> to make the graph <g> disconnected. Similarly, edge_connectivity(<g>) returns the minimum number of edges that need to be removed from the graph <g> to make the graph <g> disconnected. vertex_distance(<u>, <v>, <g>) returns the length of the shortest path between the vertices <u> and <v> in the graph <g>. The actual path could be obtained using shortest_path(<u>, <v>, <g>). girth(<g>) returns the length of the shortest cycle in graph <g>. vertex_eccentricity(<v>, <g>) returns the maximum of the vertex distances of vertex <v> with any other vertex in the connected graph <g>. diameter(<g>) returns the maximum of the vertex eccentricities of all the vertices in the connected graph <g>. radius(<g>) returns the minimum of the vertex eccentricities of all the vertices in the connected graph <g>. graph_center(<g>) returns the list of vertices that have eccentricities equal to the radius of the connected graph <g>. graph_periphery(<g>) is the list of vertices that have eccentricities equal to the diameter of the connected graph. Vertex 3 is the only centre of the graph and 0, 1, 5 are the peripheral vertices of the graph. Graph colouring has been a fascinating topic in graph theory, since its inception. It is all about colouring the vertices or edges of a graph in such a way that no adjacent elements (vertex or edge) have the same colour. Smallest number of colours needed to colour the vertices of a graph, such that no two adjacent vertices have the same colour, is called the chromatic number of the graph. chromatic_number(<g>) computes the same. vertex_coloring(<g>) returns a list representing the colouring of the vertices of <g>, along with the chromatic number. Smallest number of colours needed to colour the edges of a graph, such that no two adjacent edges have the same colour, is called the chromatic index of the graph. chromatic_index(<g>) computes the same. edge_coloring(<g>) returns a list representing the colouring of the edges of <g>, along with the chromatic index. Figure 30 shows the coloured version of the graph, as obtained by %i16. With this article, we have completed a 2 year long mathematical journey through open source, starting from mathematics in Shell, covering Bench Calculator, Octave, and finally concluding with Maxima. I take this opportunity to thank my readers and wish them bon voyage with whatever they have gained through our interactions. However, this is not the end – get set for our next odyssey. This entry was posted in Mathematics and tagged Adjacency, Centre, Chromatic Index, Chromatic Number, Colouring, Connectivity, Degree, DIameter, Digraphs, Distance, Eccentricity, Edges, Graph Properties, Graph Theory, Graphs, LFY, Linux, Maths, Maxima, Neighbours, OSFY, Periphery, Radius, Vertices on January 1, 2015 by Anil Kumar Pugalia. This twenty-third article, which is part of the series on Linux device drivers, enhances the previously written bare bone file system module, to connect with a real hardware partition. Accordingly, the error handling code would need to do the shut_browsing(info) and kfree(info). And, that would additionally also need to go along with the function corresponding to the kill_sb function pointer, defined in the previous real_sfs_bb.c by kill_block_super, called during umount. calloc() into vmalloc() & then appropriate initialization by zeros. All the above code pieces put in together as the real_sfs_minimal.c (based on the file real_sfs_bb.c created earlier), real_sfs_ops.c, real_sfs_ds.h (based on the same file created earlier), real_sfs_ops.h, and a supporting Makefile, along with the previously created format_real_sfs.c application are available from rsfs_on_block_device_code.tbz2. Once compiled using make, getting the real_sfs_first.ko driver, Pugs didn’t expect it to be way different from the previous real_sfs_bb.ko driver, but at least now it should be reading and verifying the underlying partition. And for that he first tried mounting the usual partition of a pen drive to get an “Invalid SFS detected” message in dmesg output; and then after formatting it. Note the same error of “Not a directory”, etc as in previous article, still existing – as anyways it is still very similar to the previous bare bone driver – the core functionalities yet to be implemented – just that it is now on a real block device partition. Figure 39 shows the exact commands for all these steps. Note: “./format_real_sfs” and “mount” commands may take lot of time (may be in minutes), depending on the partition size. So, preferably use a partition, say less than 1MB. With this important step of getting the file system module interacting with the underlying block device, the last step for Pugs would be to do the other transformations from browse_real_sfs.c and accordingly use them in the SFS module. This entry was posted in Linux Device Drivers and tagged Block Device, Device Drivers, File System Drivers, File System Modules, File System on Block Device, File Systems, LFY, Linux, OSFY, sb_bread(), Semester Project, VFS on December 1, 2014 by Anil Kumar Pugalia. This twenty-third article of the mathematical journey through open source, introduces graph theory with visuals using the graphs package of Maxima. 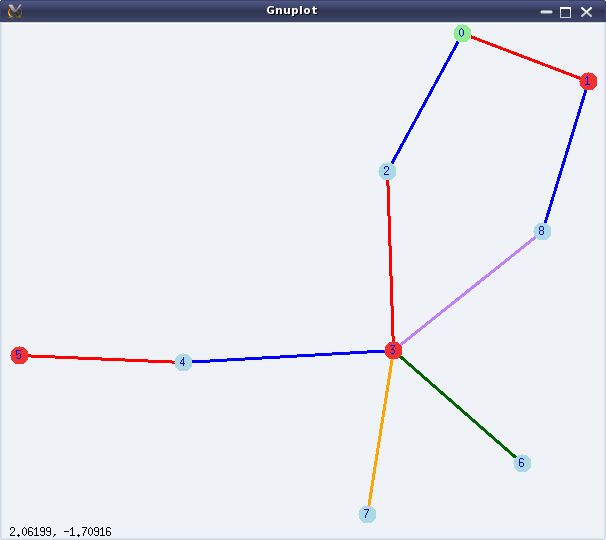 Graphs here refer to the structures formed using some points (or vertices), and some lines (or edges) connecting them. A simple example would be a graph with two vertices, say ‘0’ & ‘1’, and an edge between ‘0’ and ‘1’. If all the edges of a graph have a sense of direction from one vertex to another, typically represented by an arrow at their end(s), we call that a directed graph with directed edges. In such a case, we consider the edges to be not between two vertices but from one vertex to another vertex. Directed edges are also referred to as arcs. In the above example, we could have two directed arcs, one from ‘0’ to ‘1’, and another from ‘1’ to ‘0’. 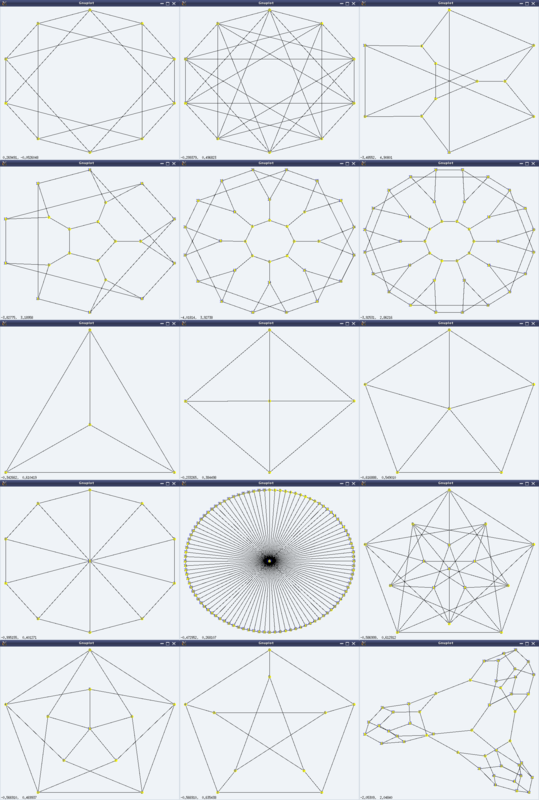 Figures 24 & 25 show an undirected and a directed graph, respectively. The “show_id=true” option draws the vertex numbers, and vertex_size and vertex_color draws the vertices with the corresponding size and colour. Note that a graph without any duplicate edges and without any loops is called a simple graph. And, an edge from a vertex U to V is not duplicate of an edge from vertex V to U in a directed graph but is duplicate in an undirected graph. 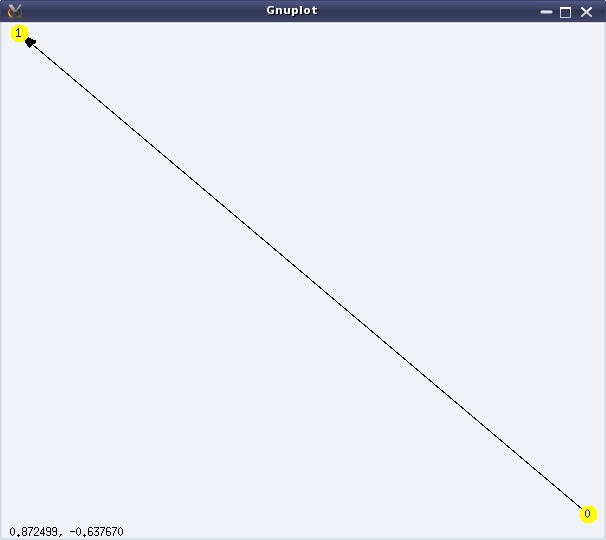 Maxima’s package supports only simple graphs, i.e. 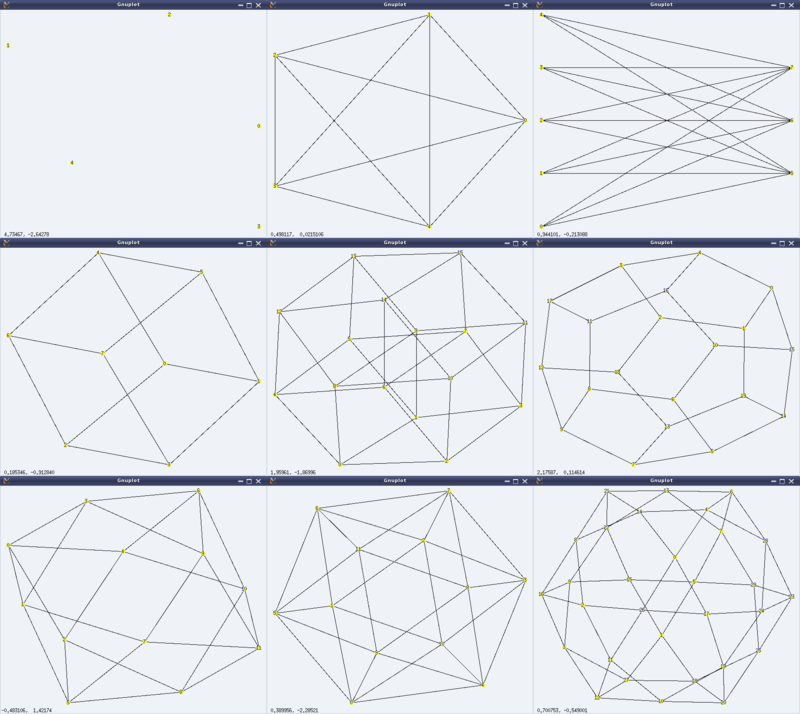 graphs without duplicate edges and loops. Graph on 2 vertices with 1 edges. Digraph on 2 vertices with 1 arcs. make_graph(<vertices>, <predicate>[, directed]) is another interesting way of creating a graph, based on vertex connectivity conditions specified by the <predicate> function. <vertices> could be an integer or a set/list of vertices. If it is a positive integer, then the vertices would be 1, 2, …, <vertices>. In any case, <predicate> should be a function taking two arguments of the vertex type and returning true or false. make_graph() creates a graph with the vertices specified as above, and with the edges between the vertices for which the <predicate> function returns true. Figures 26 shows the output graphs from the above code. Complete bipartite graph (complete_bipartite_graph(m, n)) – Simple graph with two set of vertices, having all possible edges between the vertices from the two sets, but with no edge between the vertices of the same set. With all these visualizations, you may be wondering, what to do with these apart from just staring at them. Visualizations were just to motivate you, visually. In fact, every graph has a particular set of properties, which distinguishes it from the other. And, there is a lot of beautiful mathematics involved with these properties. If you are motivated enough, watch out for playing around with these graphs and their properties. This entry was posted in Mathematics and tagged Arcs, Edges, Graph Beauty, Graph Theory, Graph Visualization, Graph Visuals, Graphs, LFY, Linux, Maths, Maxima, Nodes, OSFY, Vertices on December 1, 2014 by Anil Kumar Pugalia. This twenty-second article, which is part of the series on Linux device drivers, lays out a bare bone file system module. With the formatting of the pen drive, the file system is all set in the hardware space. Now, it is the turn to decode that using a corresponding file system module in the kernel space, and accordingly provide the user space file system interface, for it to be browsed like any other file systems. Each one of the above five structures contains a list of function pointers, which needs to be populated depending on what all features are there or to be supported in the file system (module). For example, struct file_system_type may contain system calls for mounting and unmounting a file system, basically operating on its super block; struct super_operations may contain inode read/write system calls; struct inode_operations may contain function to lookup directory entries; struct file_operations may generically operate on the page cached file data, which may in turn invoke page cache operations, defined in the struct address_space_operations. For these various operations, most of these functions will then interface with the corresponding underlying block device driver to ultimately operate with the formatted file system in the hardware space. The only difference in the above 2 functions is that in the later, the VFS mount point related structure has been removed. The printk() in there would display the underlying partition’s device file which the user is going to mount, basically the pen drive’s SFS formatted partition. get_sb_bdev() and mount_bdev() are generic block device mount functions for the respective kernel versions, defined in fs/super.c and prototyped in <linux/fs.h>. Pugs also used them, as most other file system writers do. Are you wondering: Does all file system mount a block device, the same way? Most of it yes, except the part where the mount operation needs to fill in the VFS’ super block structure (struct super_block), as per the super block of the underlying file system – obviously that most probably would be different. But then how does it do that? Observe carefully, in the above functions, apart from passing all the parameters as is, there is an additional parameter sfs_fill_super, and that is Pugs’ custom function to fill the VFS’ super block, as per the SFS file system. Unlike the mount function pointer, the unmount function pointer has been same (kill_sb) for quite some kernel versions; and in unmounting, there is not even the minimal distinction required across different file systems. So, the generic block device unmount function kill_block_super() has been used directly as the function pointer. Both register_filesystem() and unregister_filesystem() takes pointer to the the struct file_system_type sfs (filled above), as their parameter, to respectively register and unregister the file system described by it. As mentioned earlier, this function is basically supposed to read the underlying SFS super block, and accordingly translate and fill the struct super_block, pointed to by its first parameter sb. So, understanding it is same as understanding the minimal fields of the struct super_block, which are getting filled up. The first three are the block size, its logarithm base 2, and the type/magic code of the Simula file system. As Pugs codes further, we shall see that once he gets the super block from the hardware space, he would instead get these values from that super block, and more importantly verify them, to ensure that the correct partition is being mounted. After that, the various structure pointers are pointed to their corresponding structure of the function pointers. Last but not least, the root inode’s pointer s_root is pointed to the struct inode structure, obtained from VFS’ inode cache, based on the inode number of root – right now, which has been hard coded to 1 – it may possibly change. If the inode structure is obtained fresh, i.e. for the first time, it is then filled as per the underlying SFS’ root inode’s content. Also, the mode field is being hard-coded to “drwxr-xr-x“. Apart from that, the usual structure pointers are being initialized by the corresponding structure addresses. And finally, the root’s inode is being attached to the super block using d_alloc_root() or d_make_root(), as per the kernel version. All the above code pieces put in together as the bare bone real_sfs_bb.c, along with the real_sfs_ds.h (based on the same file created earlier), and a supporting Makefile are available from rsfsbb_code.tbz2. Once compiled using make, getting the real_sfs_bb.ko driver, Pugs did his usual unusual experiments, shown as in Figure 38. Oops!!! But df output shows “Function not implemented”, cd gives “Not a directory”. Aha!! Pugs haven’t implemented any other functions in any of the other four function pointer structures, yet. So, that’s expected. Note: The above experiments are using “sudo”. Instead one may get into root shell and do the same without a “sudo”. 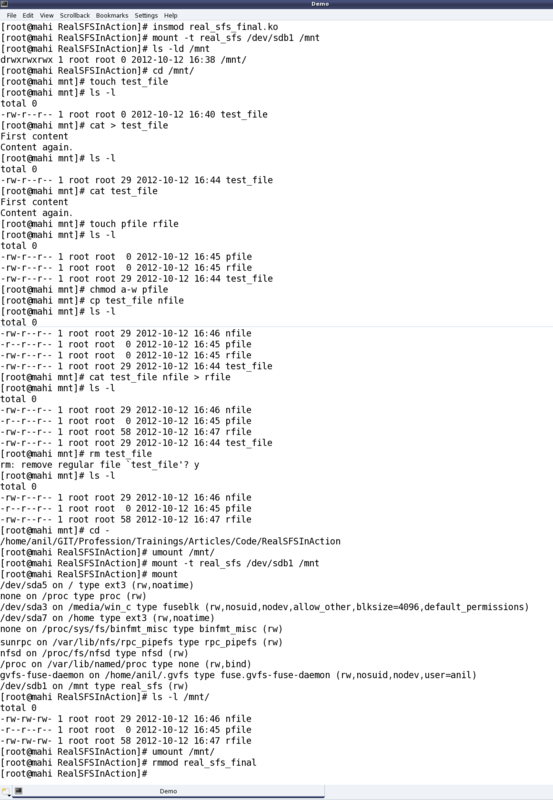 Okay, so no kernel crashes, and a bare bone file system in action – Yippee. Ya! Ya! Pugs knows that df, cd, … are not yet functional. For that, he needs to start adding the various system calls in the other (four) function pointer structures to be able to do cool-cool browsing, the same way as is done with all other file systems, using the various shell commands. And yes, Pugs is already onto his task – after all he needs to have a geeky demo for his final semester project. This entry was posted in Linux Device Drivers and tagged Buffer cache, Device Drivers, Directory entry, File System Drivers, File System Fundamentals, File System Modules, File Systems, get_sb, Inode, kill_sb, LFY, Linux, mount, OSFY, Page cache, Semester Project, struct address_space_operations, struct file_operations, struct file_system_type, struct inode_operations, struct super_operations, Super block, Superblock, VFS on November 1, 2014 by Anil Kumar Pugalia. This twenty-second article of the mathematical journey through open source, show cases managing our usual financial computations using the financial package of Maxima. In today’s credit-oriented world, loan, EMIs, the principal, interest rates, savings, etc are the common lingo. How well do we really understand these, or for that matter are able to compute the actual finances related to such things? Or, do we just accept what the other party has to provide us. One may say, either get into the gory details to understand and verify, or forget about understanding and just accept it if the offering suits you – you cannot not understand and also verify at the same time. However, with the finance package of Maxima, you can actually verify without getting much into the computational details. This article is going to exactly walk you through that. To be able to use the finance package of Maxima, the first thing to do, after getting the Maxima prompt is to load the finance package, using load(). And, then go ahead to do the various computations. days360() is the simplest function to give the number of days between two dates, assuming 360 days per year, 30 days per month – one of the common interest calculation norm. Note that days360() takes from and to dates, each as a triplet of year, month, date. And, there you go. p*(r+1)^n is the future value for investing p amount for n periods at the compounded interest rate of r per period. That requires an investment of ₹6,00,180. Yes, so if you invest that amount, the future value would be ₹10,00,000 – that’s the check done above using fv(). What is this EYI? We were supposed to talk only about EMI, right? Okay, in that case, we need to convert the rate of interest and the period, both in terms of months. So, we need to divide the per annum rate of interest by 12 to get it per month, and multiply the number of years by 12 to get that in number of months. That is exactly what the second example below shows. Note the 60 EMIs to be paid out over the period of 5 years. "n"      "Balance"    "Interest"  "Amortization"  "Payment"
"n"       "Balance"     "Interest"   "Amortization"  "Payment"
%i2 has been provided for comparative analysis. %i3 shows the incremental payout with increments of ₹10 (the second parameter of arit_amortization()). %i4 shows the incremental payout with increments at the rate of 5% (the second parameter of geo_amortization()). Both these computations could be done in decrements as well – just pass the second parameter negative. And, the minimum yearly deposit to be done is ₹17,046. The “Balance” and “Interest” columns, respectively, tell you about the balance and the interest accumulated in the corresponding year. If you are only interested in knowing the minimum amount to be deposited, you may just use the annuity_fv() function – basically computing the annuity of ₹17,046 every year for 5 years to have a future saving of ₹1,00,000 after 5 years. And clearly, over the long run the 4-year project P3 has better benefit cost ratio. But if only looking for shorter term benefits, then one may even go for project P1 as well. This entry was posted in Mathematics and tagged Daily Finance Management, Day-to-Day Finance Management, LFY, Linux, Maths, Maxima, OSFY, Real Life Finance Management on November 1, 2014 by Anil Kumar Pugalia. This twenty-first article, which is part of the series on Linux device drivers, takes the next step towards writing a file system module by writing a formatting application for your real pen drive. Accordingly, it would now expect the partition’s block device file name instead of size, as main()‘s first argument. With all the above changes compiled into format_real_sfs, Pugs plugged in his pen drive, partition of which got auto mounted. Then, he took backup of its content and unmounted the same – ready for a real SFS format of the pen drive partition. Caution: Take a backup of your pen drive’s content – you are formatting it for real. Be careful in choosing the right partition of your pen drive. Otherwise, you may forever lose data from your hard disk or even make your system un-bootable. You have been warned. and then plug out & plug in the pen drive to get auto-mounted. But, you know Pugs being a cool carefree guy, instead went ahead to try out browsing the Simula file system created on the pen drive partition. Obviously, there were slight modifications to the browse_sfs.c application as well, in line with the changes to format_sfs.c. Major one being compulsorily taking the partition’s device file to browse as the command-line argument, instead of browsing the default regular file .sfsf. All the updated files (real_sfs_ds.h, format_real_sfs.c, browse_real_sfs.c and Makefile) are available from rsfs_code.tar.bz2. Figure 37 shows the browser in action. However, the coolest browsing would be the same way as is done with all other file systems, using the shell commands cd, ls, … Yes, and for that we would need the real SFS module in place. Keep following what’s Pugs upto for getting that in place. This entry was posted in Linux Device Drivers and tagged Device Drivers, File System Drivers, File System Modules, File Systems, Formatting, Formatting a Pen Drive, LFY, Linux, Making File System, mkfs, OSFY, Semester Project on October 1, 2014 by Anil Kumar Pugalia. This twenty-first article of the mathematical journey through open source, demonstrates the Laplace transforms through Maxima. In higher mathematics, transforms play an important role. A transform is mathematical logic to transform or convert a mathematical expression into another mathematical expression, typically from one domain to another. Laplace and Fourier are two very common examples, transforming from time domain to frequency domain. In general, such transforms have their corresponding inverse transforms. And this combination of direct and inverse transforms is very powerful in solving many real life engineering problems. Focus of this article is Laplace and its inverse transform, along with some problem solving highlights. where t represents time and s represents complex angular frequency. Is  n + 1  positive, negative, or zero? Note that, in the above examples, the expression is preserved as is, in case of non-solvability. laplace() is designed to understand various symbolic functions, such as sin(), cos(), sinh(), cosh(), log(), exp(), delta(), erf(). delta() is Dirac delta function, and erf() is the error function – others being the usual mathematical functions. Note the usage of ilt() – inverse Laplace transform in the %i8 of above example. Calling laplace() and ilt() one after the other cancels their effect – that is what is meant by inverse. Let’s look into some common inverse Laplace transforms. Is  a  zero or nonzero? Observe that if we take the Laplace transform of the above %o outputs, they would give back the expressions, which are input to ilt() of the corresponding %i’s. %i18 specifically shows one such example. It does laplace() of the output at %o16, giving back the expression, which was input to ilt() of %i16. Now, with these insights, we can easily solve many interesting and otherwise complex problems. One of them is solving differential equations. Let’s take a simple example of solving f'(t) + f(t) = e^t, where f(0) = 0. First we take the Laplace transform of the equation. Then substitute the value for f(0), and simplify to obtain the Laplace of f(t), i.e. F(s). And, then finally compute the inverse Laplace transform of F(s), to get the solution for f(t). Thus, giving f(t) = (e^t – e^-t) / 2, i.e. sinh(t), which definitely satisfies the given differential equation. Similarly, we can solve equations with integrals. And, why only integrals – rather equations with both differentials and integrals. Such equations come very often in solving for electrical circuits with resistors, capacitors, and inductors. Let’s again take a simple example to demonstrate the fact. Say, we have 1 ohm resistor, 1 farad capacitor, and 1 henry inductor in series being powered by a sinusoidal voltage source of frequency w. What would be the current in the circuit, assuming it to be zero at t = 0? It would yield the following equation: R * i(t) + 1/C * ∫ i(t) dt + L * di(t)/dt = sin(w*t), where R = 1, C = 1, L =1. Is  w  zero or nonzero? This entry was posted in Mathematics and tagged Engineering Problems, Frequency Domain, Integral Transforms, Inverse Laplace Transforms, Laplace Transforms, LFY, Linux, Maths, Maxima, OSFY, Time Domain on October 1, 2014 by Anil Kumar Pugalia. This twentieth article, which is part of the series on Linux device drivers, completes the basic simulation of a file system in user space. Here’s a sneak peek into her thinking process as how she came up with her implementations. sfs_lookup() traverses through all the entries (skipping the invalid i.e. empty filename entries), till it finds the filename match and then returns the index and the entry of the matched entry in the function’s third parameter. It returns -1 in case of no match is found. sfs_update() uses sfs_lookup() to get the entry and its index for the given filename. 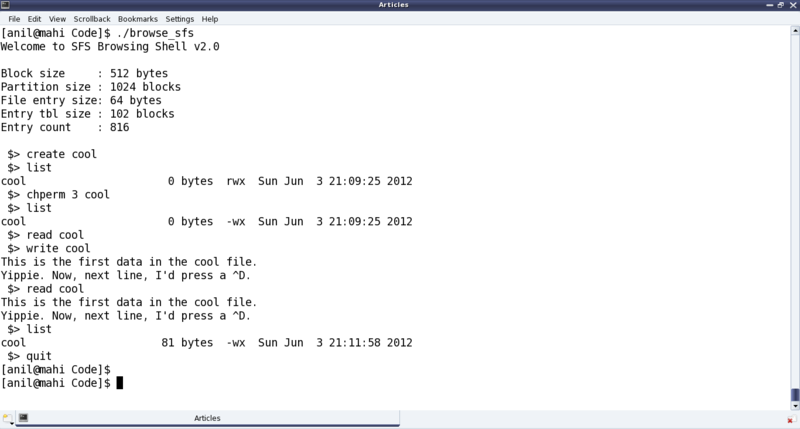 Then, it updates it back into the filesystem with: a) size, if passed (i.e. non-NULL), b) current timestamp if update_ts is set, c) permissions, if passed (i.e. non-NULL). to_read = (rem_to_read >= sb.block_size) ? Interestingly, write is not a trivial function. Getting data from the user through browser is okay. But based on that, free available blocks has to be obtained, filled and then their position be noted sequentially in the blocks array of the file’s entry. Typically, we do this whenever we have received a block full data, except the last block. That’s tricky – how do we know the last block? So, we read till end of input, marked by Control-D on its own line from the user – and that is indicated by a return of 0 from read. And in that case, we check if any non-full block of data is left to be written, and if yes follow the same procedure of obtaining a free available block, filling it up (with the partial data), and updating its position in the blocks array. In either of the 2 cases, the thought is to do a graceful stop with data being written upto the maximum possible, and discarding the rest. With the above 3 sfs command functions, the final change to the browse_sfs() function in (previous article’s) browse_sfs.c would be to add the cases for handling these 3 new commands of chperm, write, and read. All these thoughts, incorporated in the earlier sfs_ds.h and browse_sfs.c files, along with a Makefile and the earlier formatter application format_sfs.c, are available from sfs_code.tar.bz2. Once compiled into browse_sfs and executed as ./browse_sfs, it shows up as something like in Figure 35. As Shweta, showed the above working demo to her project-mate, he observed some miss-outs, and challenged her to find them out on her own. He hinted them to be related to the newly added functionality and ‘getting free block’ framework – some even visible from the demo, i.e. Figure 35. Can you help Shweta, find them out? If yes, post them in the comments below. This entry was posted in Linux Device Drivers and tagged Device Drivers, File System Drivers, File System Modules, File Systems, LFY, Linux, OSFY, Semester Project on September 1, 2014 by Anil Kumar Pugalia. This twentieth article of the mathematical journey through open source, showcases the list manipulations in Maxima. Lists are the basic building blocks of Maxima. The fundamental reason being that Maxima is implemented in Lisp, the building blocks of which, are also lists. To begin with, let us walk through the ways to create a list. Simplest way to have a list in Maxima is to just define it using [ ]. So, [x, 5, 3, 2*y] is a list consisting of 4 members. However, Maxima provides two powerful functions for automatically generating lists: makelist(), create_list(). makelist() can take two forms. makelist(e, x, x0, xn) creates and returns a list using the expression e, evaluated for x using the values ranging from x0 to xn. makelist(e, x, L) – creates and returns a list using the expression e, evaluated for x using the members of the list L. Check out the example below for better clarity. Note the interesting usage of concat() to just concatenate its arguments. Note that, makelist() is limited by the variation it can have – to be specific, just one – i in the first two examples, and x in the last one. If we want more, that is where the create_list() function comes into play. Note the “all possible combinations” being created using the values for the variables x, y, z. Once we have lists created, Maxima provides a host of functions to play around with them. Let’s take a walk through them. rest(L, n) – returns a list with members of L, except the first n members (if n is non-negative), otherwise except the last -n members. n is optional, in which case, it is taken as 1. Note that the list L is still not modified. For that matter, even L1, L2, L3 are not modified. In fact, that is what is meant by that all these functions recreate new modified lists, rather than modifying the existing ones. Again, note that the list L is still not modified. But, why have we been talking of that? To bring out the fact, that we may need to modify the existing lists, and none of the above functions would do that. Note that, we may achieve that by assigning the return values of the various list recreation functions back to the original list. However, there are few functions, which does that right away. Note that L must be a symbol bound to a list, not the list itself, in both the above functions, for them to modify it. Also, these functionalities are not available by default, so we need to load the basic Maxima file. Check out the demonstration below. We may display L after doing these operations, or even check the length of L to verify the actual modification of L. And, in case we need to preserve a copy of the list, function copylist() can be used, as such. sublist_indices(L, p) – returns the list indices for the members of the list L, for which predicate p is true. assoc(k, L, d) – L must have all its members in the form of x op y, where op is some binary operator. Then, assoc() searches for k in the left operand of the members of L. If found, it returns the corresponding right operand, otherwise d, or false, if d is missing. Check out the demonstration below for both the above operations. This entry was posted in Mathematics and tagged LFY, Linux, Lists, Maths, Maxima, OSFY on September 1, 2014 by Anil Kumar Pugalia.